Chelsea face a Manchester City side fresh from reaching the semi-finals of the Champions League. Who will win at Stamford Bridge on Saturday evening? 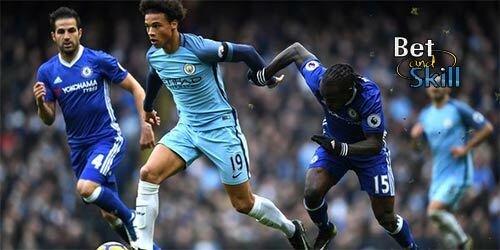 Read here our CHELSEA v MANCHESTER CITY betting preview with free predictions, betting tips, best odds, lineups, bookmakers offers and no deposit free bets on the Premier League! Chelsea lost to Swansea last weekend and the Blues are already looking forward to next season with nothing left to play for. The Blues have won only five of their home games this season, with no less than 11 clubs leaving Stamford Bridge with at least a point. Hiddink's men can still boast an 8 unbeaten record at home, but they won just 2 out of those as 6 of those were draws. Guus Hiddink will have Diego Costa following the forward's three match suspension. John Terry had treatment on an Achilles injury and will certainly not be available. He will be replaced by Branislav Ivanovic while Kenedy will cover the righ back position. Ruben Loftus-Cheek has started the last two matches in the number ten role in the 4-2-3-1 formation and may keep his place in the side. Nemanja Matic is available, whereas Eden Hazard is 50/50. They are expected to start on the bench. Manchester City booked their place in the UEFA Champions League semi-finals with a 1-0 second-leg win over PSG on Tuesday night. Pellegrini’s side currently occupy the final qualifying spot in Premier League and their qualification for next season’s competition is far from secure. The Citizens followed up their emphatic 4-0 win over Bournemouth with a 2-1 triumph at home West Brom. Manuel Pellegrini is without David Silva for the trip to Stamford Bridge. Yaya Toure was benched for their clash against PSG following a knee injury and should be replaced by Jesus Navas once again. Raheem Sterling is also still ruled out through injury. In defense, Vincent Kompany is losing his race to be fit and this means that Otamendi and Mangala will retain their starting berth. Chelsea thrashed City 5-1 when they met last, but that saw Manuel Pellegrini field a team of youngsters in the FA Cup. The reverse fixture was a 3-0 City win at the Etihad Stadium on August 16. Enhanced Odds! 7/1 Chelsea or 10/1 Man City to win + £100 bonus! Risk-free! Double boost! 9/1 Chelsea or 10/1 Manchester City to win + £5 bonus! Price boost! Get 9/1 Manchester City to beat Chelsea! Crazy price! Get 7/1 Chelsea to beat Man City + £20 in free bets! "Chelsea v Manchester City predictions, betting tips, lineups and odds (Premier League - 16.4.2016)"